Welcome to Real Life. In the midst of this festive season, I long for the supernatural to invade my natural. He pulls aside the heavy curtain and silently slips inside. “Don’t hurry,” Zechariah tells himself. “Savor this. It may be the only time you enter this holy place.” His eyes survey the room, taking in the detail of resplendent gold articles. “Lord, you are present,” he whispers. The thought disquiets him. But then, he hears his fellow priests praying for him beyond the curtain. His courage rises. He approaches the altar and lights fresh incense. As its sweetness adorns the room, Zechariah is overcome by a sense that he is not alone. Zechariah serves as a priest in the Temple of the Lord. Though every priest is intimately acquainted with the building, not every priest has entered the Most Holy Place. Each morning and evening, a single priest is chosen by lot to enter and refresh the incense which burns perpetually before the Lord. Casting lots seems random, like tossing a coin. But Israel understands. The choice is not random. Casting lots removes man’s interference. God alone chooses the priest who will enter his Holy Place. God chose Zechariah. No doubt about it. 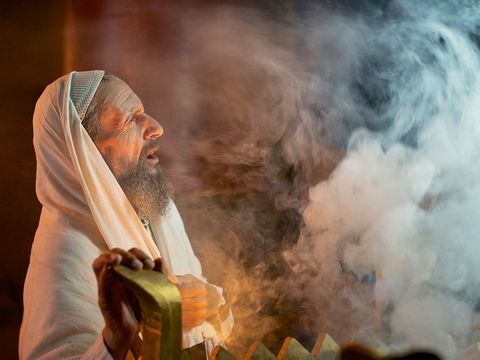 Zechariah inhales the fragrant incense and lifts his eyes. Before he can turn to leave, a magnificent sentinel appears before him. Startled, Zechariah takes a step back. Every day, I choose you. Every day, I invite you to pull aside the curtain and enter my Most Holy Place. Will you come? Will you experience the miraculous? For this is why I was born in Bethlehem. To be Emmanuel. God with you. About that heavy curtain... At the moment Jesus Christ died, the veil of the temple was rent in two—top to bottom. The very same veil Zechariah pulled aside. No longer would the privileged few enter God’s presence. His door is open to all, billionaire and homeless, uneducated and scholar, giver and thief. This is the miracle of Christmas! God loves you and me so dearly. He came to rescue us. Born a helpless infant. Died to win our ransom. Alive forevermore. He chooses you! Is your heart prepared to welcome Jesus? Learn more at Chat About Jesus. Listen to "O Come, O Come, Emmanuel." Excerpts of the hymn "O Come, O Come, Emmanuel"
The cry of my heart is to pull back the curtain.